“Are you a praying man?” Detective Phil Large said as he hoisted the suspect by the collar and belt, then hung him, head-first, out of the third story window. According to the story told to me by a veteran detective in the Camden County Prosecutor’s Office, the suspect confessed immediately. I was surprised, not that Phil might have dangled a man out the window, but that the suspect didn’t confess as soon as he entered the same room with my uncle. Philip Large, at six foot four, towered over everyone. His thick dark hair and “five o’clock” shadow added to his law and order mien. I was scared of him! One of my earliest memories is my trying to crawl from one chair to another at my grandmother’s house without drawing the giant’s attention. (Yes, I said crawl, so I must have been a baby or a toddler at the time). The giant saw me and scooped me up into his arms with a great roar and a belly-tickle! I don’t have many memories of Uncle Phil because he died in 1964 after the degenerative disease ALS slowly and methodically paralyzed him. Seeing such a huge, tough legend-of-a-man rendered immobile in a wheelchair was more terrifying to me than were those belly-tickles. The doctors thought that Phil’s years in a German prisoner of war camp during World War II might have triggered his disease. Phil was captured in Tunisia early in the war and was not released until his camp was liberated. His beloved father William died of appendicitis during Phil’s captivity, and the news devastated Phil. When Phil arrived back in Camden, his own sister Irma walked past him on the street. She did not recognize her own brother because Phil had lost so much weight and looked so haggard. Irma told me that Phil, so gregarious and outgoing before the war, stayed inside the house with the shades drawn for weeks. About ten years ago, I received a telephone call from an unknown woman. 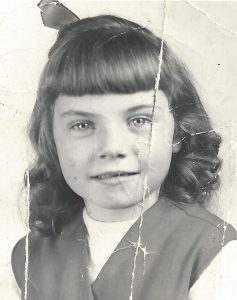 She found me through a newspaper interview I had given to a Courier Post reporter about World War II prisoners of war. The woman claimed that her late husband was captured in Tunisia with Uncle Phil. The husband had been seriously wounded, and Phil saved his life by carrying him across Tunisia, then Italy, then through German lines to POW Camp 3B near Stuttgart, Germany. A few months later, I received a packet from a newspaper reporter filled with articles about Phil’s career. As a Camden City police officer and a Camden County detective, Phil cracked many cases and made notable arrests. My favorite story is an interview Uncle Phil gave to a reporter when he was sixteen. Phil had been selling newspapers on the corner of 3rdand Federal Streets in Camden since he was eight years old. According to the article, young Phil considered himself an entrepreneur and intended to carve out a career in the newspaper business.
. . . that’s what Phil said.